Nordic facilities across the valley are now open and welcoming skiers, due to a storm that dumped up to 14 inches of snow on the valley floor on Sunday night and Monday. Blaine County Recreation District Executive Director Jim Keating said Monday that the entire length of the Wood River Trails system was groomed during the course of the day. Trail users—including classic and skate skiers—can now ski from Hulen Meadows to south of Bellevue along the 20-mile paved (and now groomed) trail. “We’ve taken the groomer the whole way today,” he said, adding that before the storm, the district was only able to use a snowmobile to flatten out some snow on the trail from Hulen Meadows to Ketchum. Keating said the storm was welcome, but that the Recreation District is hoping for a few more inches in to provide an optimal snowpack. 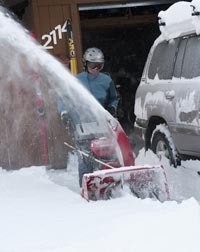 A PistenBully is a large groomer used to roll corduroy on both alpine and Nordic trails. The groomer, Keating said, will also set classic track if the snow is deep enough. Keating said the new south valley Nordic center, Croy Nordic out Croy Canyon west of Hailey, is also open thanks to the storm. The south valley Nordic center saw between 8 and 9 inches of snow, enough to allow it to open before Christmas. Keating urged caution on some parts of the trails where the snowpack might still be a little thin. Sun Valley Co. spokesman Jack Sibbach said Tuesday morning that the resort opened 23 kilometers of Nordic and snowshoeing trails at the Sun Valley Nordic Center on Trail Creek Road. Sibbach said the resort is opening more trails as they are groomed and ready, with the goal of opening 100 percent of its 15 Nordic trails by Saturday. “Looks like it’ll be all open for the weekend and have great conditions,” he said. The latest storm followed others earlier this month that brought rain to lower elevations and 3 feet of heavy, wet snow to Bald Mountain. National Weather Service meteorologist Bob Survick in Pocatello said Monday that while this latest storm was the result of a cold-air system around Alaska and a low-pressure trough off of the West Coast, it’s harder to pinpoint whether the storms are part of a larger weather system. But regarding a larger system, Survick said there are hundreds of climatological factors that can contribute to weather systems at any given point. The nation is currently experiencing La Niña—a tropical weather pattern that was expected to bring warm, dry weather to the valley this year—but Survick said Idaho weather is tough to forecast based on that pattern. “Idaho ends up being just far enough inland and in just the right position that whether we’re in La Niña or El Niño, quite often the pattern is [inconclusive],” he said. Survick said the valley is expected to experience cold, dry weather for a few days before another slow-moving low-pressure system works its way across the West Coast, possibly bringing more snow in time for Christmas.